Group founder Dale Goldhawk spent decades in the media fighting for the rights of consumers and individual Canadians to get fair deals and justice. He has been deeply involved – and often the featured personality – in numerous crises. He has been a print reporter, magazine writer, book author, broadcast reporter, broadcast host in radio and TV, union leader, and one of Canada’s best advocates. Now, he is a public and media relations practitioner providing an array of services in league with his experienced and talented team leaders. He is involved in our communications training, providing his experience and expertise to CEOs and other leaders of corporations, organizations and government bodies, Canada-wide. 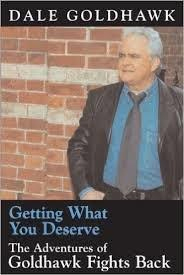 Read Dale’s “Getting What You Deserve” now. Great journalism lives on in this account of Dale’s adventures fighting against fraud and incompetence across Canada.